A few weeks back, we exclusively reported that Samsung is working on several new Android tablets. 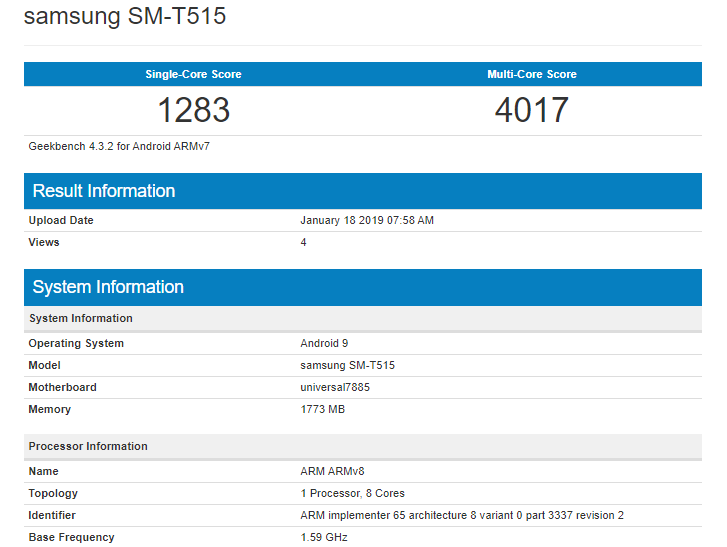 One of the upcoming tablets, bearing the model number SM-T515, has now appeared on the benchmarking website Geekbench. Samsung may announce the tablet at the Mobile World Congress 2019 in February in Barcelona. It has scored 1283 points as the single-core score and 4017 points as multi-core score in Geekbench. The Geekbench listing reveals that the upcoming tablet will have just 2GB RAM and will be powered by the Exynos 7885 octa-core SoC. It’s the same SoC that powers Samsung’s current crop of mid-range smartphones, including the Galaxy A7 (2018). It’s not yet clear if the company plans to launch another variant of the tablet with more RAM. On the software front, the SM-T515 will come with Android 9.0 out of the box, and possibly with Samsung’s new “One UI” for tablets. Going by the model number, this appears to be the 4G/LTE version of the tablet since it ends in ‘5’. The model numbers of Wi-Fi variants of Samsung tablets usually end in ‘0’. As reported by us earlier, the tablet will be available in Black and Silver color options at launch. Apart from these details, not much is known about the SM-T515. Samsung is also working on at least two more variants of the Galaxy Tab A with model number SM-P200 and SM-P205, as well as tablets with model numbers SM-T720 and SM-T725. The marketing names of the latter are not known yet. More details about these upcoming Samsung tablets should surface online come February. 2 Gigs??? Come on Samsung, It is 2019! 4 gigs at least!